Nanak was aware of his sons' rejection of Angad as his successor, and anticipating their hostile reaction, he directed Angad to return to Khadur. Although the devoted Angad was reluctant to leave Nanak and wanted to remain with him until his last breath, he obediently agreed and returned to Khadur. An episode of Satta and Balwand, the minstrels, whose ego led them to think that they were indispensable in their rendering of music carries a lot of importance in Sikhism, as because of their defiance, the art of Gurmat Sangeet was introduced by Guru Angad. These brothers were of the convictions that the Guru depended on their musical skills to run the Panth, but the Guru banished them and asked the Sikhs to sing the hymns of Nanak. This was the turning point in history where the Sikh World was introduced to Gurbani and Classical Music. Although the minstrels were pardoned and their saloks were added to the Adi Granth later on, but the 'sangeet tradition' was already imbedded in the minds of the Sikhs. And this tradition became the backbone of the Sikh fraternity. Guru Angad's daily routine started with devotion, penance and austerities and he was completely engrossed in His Name. The rendering of Nanak's banis in the congregations was a regular item and another very significant tradition developed during his time, the tradition of Langar or common kitchen, which is the essence of Sikh Panth. His wife Mata Khivi was on the forefront of this venture that provided food for the pilgrims and wayfarers. Although this tradition was prevalent during Nanak's time but its development happened especially during Angad's time. Guru Angad's teachings involved around the teaching of Nanak, whose commands requiring devotees to 'to eat the fruit of their labour and bestow something', was preached and practised by Guru Angad himself as he earned his own living by twisting the course twine made of 'munj'. His other interests included watching wrestling matches, as he was of the conviction that his spiritual mission should be fortified with development of physical vigour, which were an essential needs of a householder's life. In other words the combination of 'Bhagti and Shakti' is very fundamental to a Sikh in his venture to salvation. A noticeable new elaboration that the Sikh traditions attribute to Angad is the invention of the Gurmukhi alphabet. And according to the Tawarikh Guru Khalsa, the invention took place on Baisakh sudi panchmi, 1597. According to Macauliffe, "the Guru was so elated with the adoption of a new character for the hymns of his predecessor, that he composed a hymn addressed to God which was found recorded in an ancient manuscript at Khadur. The hymn itself, however, contains no reference-direct or indirect-to the invention or adoption of a new script." And furthermore Guru Nanak composed the 'patti' in Rag Assa, which contains all the 35 letters of the alphabet, hence called 'Penti' (35). Some attribute this patti to Angad but it occurs in Mahalla 1, which exclusively points it to Nanak. It is clear, therefore, that the alphabet known as 'Gurmukhi' was in existence and also in common use in those days of the first Guru, otherwise the Guru would not have used it had it been alien or obscure. This can be surely said that the thirty-five letters of the 'Penti' in the present form is attributed to the genius of Guru Nanak. Guru Angad is responsible for the evolution of the 'Gumukhi' language and it gave the Sikh nation a new sense of independence and self-confidence. They could now write not only their sacred hymns but also their secular literary compositions and ordinary correspondence in a script that was their own in a distinct sense. Another notable achievement during Angad's time was the writing of the Bala Janamsakhi. Guru Angad got the services of Paira Mokha, a Sikh from Nanak's time, who was literate in Gurmukhi to prepare the biography of Guru Nanak. For this the help of Bhai Bala, a devout disciple and partner of Guru Nanak and who had accompanied the Lord on many of his divine journeys, was called from Kartarpur. With the help of these two the 'Bhai Bala Janamsakhi' came into being. Although the original copy is extinct now but copies of it are available and though the modern researchers do not give much credence to it, but never the less it remains a very important work of hagiography in the Sikh faith. 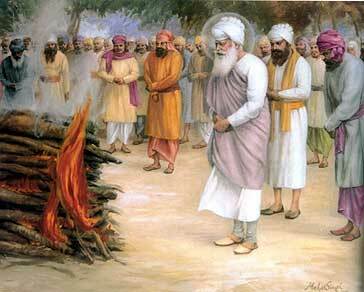 Guru Angad died at the age of forty-eight on 28th March 1552 AD after a relative brief term of the pontificate. The infant Sikh Panth could hardly have maintained its integrity and advanced towards solidarity if he had not worked with full devotion and his firm belief in the grace of the Almighty. A devoted and pious disciple was discovered in Amardas, who was found worthier to carry the spiritual torch of Nanak in the further development of the Sikh Nation towards the advent of the Khalsa Panth in 1699 AD by the tenth master Guru Gobind Singh.